A new report underlines how major consumer product goods brands are suffering in today's brutally competitive retail environment. Nearly two-thirds of the top 100 CPG brands tracked by Catalina suffered dollar sales declines in the 52 weeks ending June 30, and combined dollar sales volume for the 100 was down slightly — despite sales growth in every major category in which they compete. Even among the 38 top 100 brands that saw sales growth, the average gain, 5.5%, lagged the average gain seen in their categories: 7.2%. Furthermore, 90 out of the top 100 lost market share. Those are the headlines from a just-released review of the sales and loyalty performance of the top 100 CPGs from Catalina, which uses its transactions history database and mobile, online and in-store networks to reach consumers with customized promotions. The review is based on a sample of the 26,000 food, drug, and mass retailers in Catalina's network, and the results are generally in line with national network results, according to the company. Total sales volume for the top 100 CPG brands tracked by the company declined by 0.8% during the 12-month period, to $56.8 billion, versus $57.3 billion in the 12 months ended in June 2014. A significant majority — 62 — saw sales declines, with the average decline 4.4%, while the categories in which they compete saw average sales growth of 5.4%. The top CPG brands saw sales declines in nine of what Catalina calls the 14 "mega-categories": frozen (eight top brands tracked were -7.8%, versus an overall category gain of 3.5%); cereal (four brands, -5.5%; category +2.4%); pet (four brands, -5.5%; category +5.7%); household (three brands, -2.9%; category +2.5%); baby (five brands, -1.6%; category +5%); crackers, cookies, bread (11 brands, -1.4%; category +4.3%); paper (seven brands, -1.2%; category +5.1%); refrigerated meats (six brands, -0.4%; category +11%) and candy and snacks (eight brands, -0.3%; category +5.9%). 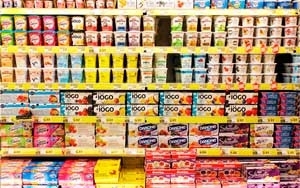 The five mega-categories in which top 100 CPGs had sales increases were grocery (10 brands, +2.3%; category +5.2%); dairy (12 brands, +1.5%; category +7.3%); soft drinks (eight brands, +1.3%; category, +7.4%); HBC (10 brands, +0.7%; category +8.1%) and coffee (four brands, +0.1%; category +9.4%). On the positive side, increased consumption per buyer was the biggest growth driver, accounting for a 5% increase in sales for the growing brands within the top 100. On the negative side, the study, which also analyzes brand loyalty patterns, found that brand shifting within categories had the single biggest effect on the top brands, accounting for a 4.4% decrease in their combined dollar sales volume. Catalina's Brand Shifting Interaction Index, which looks at sales volume switching among brands, found that in 12 of the 14 mega-categories, top 100 brands exchanged volume with private label brands 58% more than would be expected based on a normalized share. The company's New Buyer Attraction Index found that top 100 brands scored higher than their share of the category in six of the 14 mega-categories, while private label brands scored higher than their fair share in seven categories. In short, the challenges for leading brands has grown even more acute as consumer preferences have become more diverse and selective across an ever-expanding number of both national and private label CPG product and brand choices, summed up Catalina U.S. president Todd Morris. Catalina's 2015 Mid-Year Top 100 Brands Performance Review can be downloaded at Catalina's site.